Height 6 feet ½ inch. Weight 12 stone. Chest measurement 34-38 inches. Complexion dark. Eyes brown. Hair dark. Hearing, sight and colour vision all normal. Limbs and chest well formed. Full and perfect movement of all joints. Heart and lungs normal. Teeth fair. No illnesses. Free from hernia, varicocele, varicose veins, haemorrhoids, inveterate or contagious skin disease. Vaccinated. Good bodily and mental health. No slight defects. No fits. Deemed 'Fit for Service'. 9-24 July 1916 -Featherston Hospital, German measles. 5-25 February 1917 - 7th General Hospital, St Omer, France, mumps (slight). 24 June 1917 - slightly wounded, remained with unit. William Robert Keay, known as Robert or Bob, was born on 8 October 1885 at Corra Lynn Station, near Fairlie, in the Mackenzie Country of South Canterbury. He was the third son of William Robert and Ellen (née Steele) Keay. His father, who had come to New Zealand in 1863 and settled at Burke’s Pass with his brother John by the early 1870s, owned and farmed Corra Lynn Station at Sherwood Downs. During the depression of 1893 the family left Corra Lynn and moved to Herekino in the North Island, their property there being named Sedgeley. Mr Keay had been long resident in the Fairlie district and was held in much respect and esteem. In the north he served on the Whangarei County Council and was active in county affairs. Bob and his brothers, David and Thomas, appear to have been the mainstays of the Herekino cricket team, all starring with both bat and ball. Bowling in a match against Kaitaia in February 1915, he dismissed five of the opposition in the first innings and again in the second innings. His 15 with the bat was a useful contribution to the team’s total. He was not required to bat in the second innings. Bob was working on the family farm, “Sedgeley” at Herekino, when he enlisted on 21 May 1916, 30 years, Presbyterian, and single, with dark complexion, dark hair and brown eyes. He was a well-built, upright man, standing at just over 6 feet and weighting 12 stone. Being in good bodily and mental health, although his teeth were only fair, he was deemed ‘Fit for Service’. His nominated next-of-kin was his father, William Robert Keay, of Herekino. He was one of 79 men in the Whangarei quota for the 17th Reinforcements Infantry who left Whangarei on 30 May 1916, the full quota and more having been reached in the week before departure. While at Featherston he contracted German measles and spent two weeks in hospital in July. Attached to the New Zealand Rifle Brigade, 8th Reinforcements, he embarked per the Pakeha at Wellington on 23 September 1916, destined for Devonport, England. At Sling Camp he was posted to the 2nd Battalion, 3rd New Zealand Rifle Brigade. After going to France in early January 1917, Robert Keay was again hospitalised, this time on 5 February 1917 at the 7th General Hospital, St Omer, with mumps (slight). Prior to his involvement in the Battle of Messines from 18 March to 2 April and again from 24 April to 18 May 1917, he was twice detached to a working battalion – firstly on 12 March and secondly for a month from mid April. Messines was the major focus of his time at the Front. On 7 June at 3.10 pm the New Zealand Division went over the top at Messines and, in two days of fighting, took all of its objectives. The battle continued until 30 June. 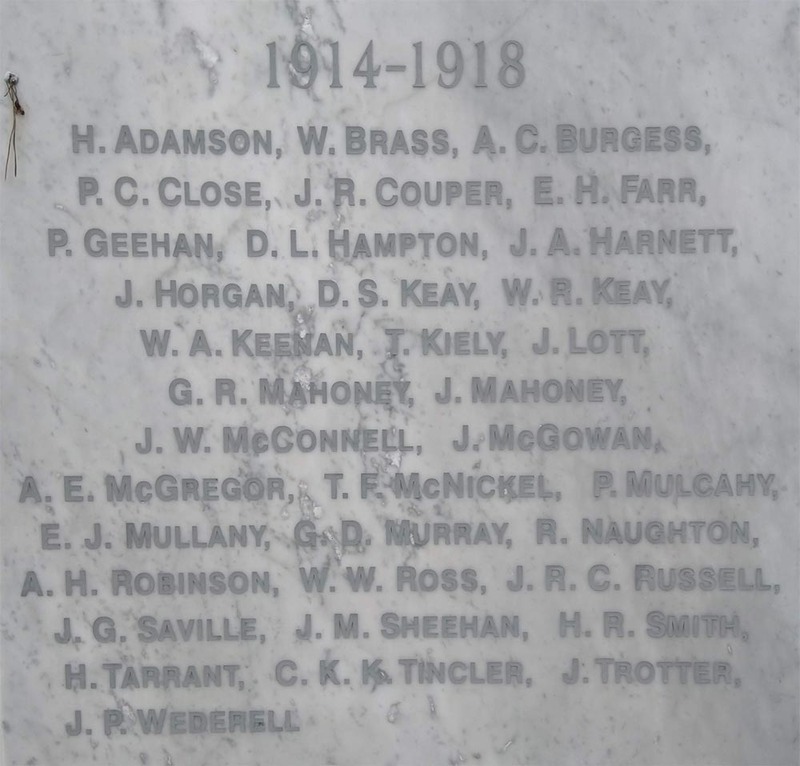 On 21 June 1917 Rifleman W. Robert Keay, of the Rifle Brigade and son of W. R. Keay, Herekino, was slightly wounded but remained with his unit, only to be killed in action about seven weeks later. Casualty List No. 653, issued on 23 August, brought the news that he had been killed in action on 5 August 1917 in the field, Ypres, Belgium, aged 31 years. Bob was killed by a shell whilst in the trenches near Messines but about two months after the Battle of Messines which he had fought in and survived. He was buried in the La Plus Douve Farm Cemetery, Warneton, Hainaut, Belgium, 1¾ miles south-west of Messines. There lie 61 men of the New Zealand Forces. William Robert Keay, senior, was a frequent writer to the editor of the Northern Advocate. In September 1935 he discussed two questions posed with regard to Britain’s financial position in 1930 – “Who were responsible for causing the Great War?” and “What caused that dreadful outbreak of human passions?” An older brother, Thomas Melville Keay, farming at Herekino, was called up in 1917, but was not required to serve. William David Keay, who served in World War II, was a son of Thomas Melville Keay and was named for his two uncles who were killed in World War I. Thomas Keay of Fairlie, who was killed in action in 1917, was a cousin of William Robert and David Steele Keay. David Smith Laing Keay and Ernest James Keay who also served in World War I may have been related.